The physical impossibility of its creation. I’m refering of course to a flat earth map that is an alternative to the current world map. According to my extensive research the production of a flat earth ‘alternative map’ is an impossibility rendering the flat earth also impossible. The main problem is that for a flat earth map to exist something would have to give, and by that I mean land masses including towns cities, mountains and rivers would have to be relocated, which as we all know is an impossibility. If we start with the Americas, this continent is criss crossed with a vast and complex network of both road and rail with known and fixed start and end points. The 30,000 Km long Pan American Highway being a vast road network stretching from Alaska to Chile albeit with a smallish gap of 100Km. The upshot is the geography of this continent is known and fixed with the location of every town, mountain river and forest known. Using commercial maps you could drive anywhere on this continent, like I did driving Route 66 in the late 80s, and be confident about both distances covered and the exact location of your final destination. The same could be said of all the other continental land masses. I could take trains, as you all could, from London in the West to Vladivostok in the East, a distance of over 8,500 Km. The track is fixed securely to the ground and passes through all the stop offs acording to published maps. International communications by land sea and air where the exact locations of both start and end points are known make it impossible for the geography of the planet to be reinterpreted. With the layout of all the major land masses established the positional relationship of an island like Australia can be established by the intricate sea lane connections with major ports in Asia, Europe and the Americas. 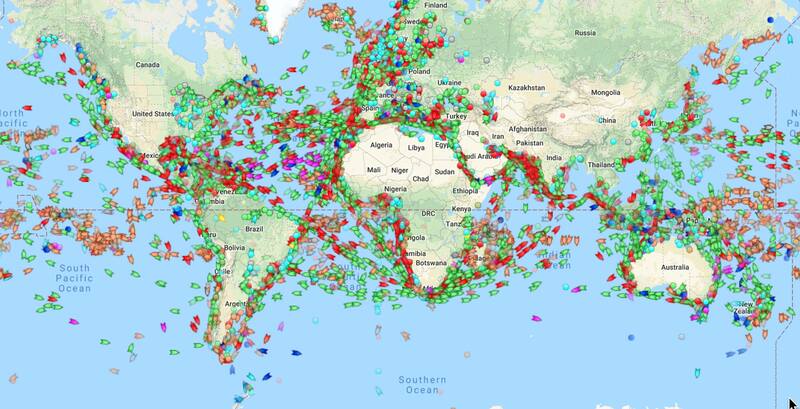 These sea lanes are travelled every day of the year by a vast armada of container ships carrying both finished goods and raw materials. To reiterate. Given how the location of every point on earth is accurately known relative to many other points it’s just not possible for the geography of the earth to be reinterpreted rendering the production of a flat earth map alternative as an impossibility. Re: The physical impossibility of its creation. I find it rather disingenuous of you to state you do not want to get "bogged down," in a discussion of projections, but okay. In that case, I want you to point out what 3D spherical maps are currently in use and their reliability. Oh, I would be remiss in failing to point out 3D holographic projection is fact, so if you like go ahead and research that. Should be relatively easy for you to find one. 1) ASK WHY THE HELL NOT! B) INVENT ONE (and I only want 20 percent finders fee). This post and the ideas/proposals in it are my intellectual property (in case no 3D holographic map exists or is currently not in use). I’m not sure why you think my wish not to discuss projections are disingenuous, when they are in regard to my initial question totally irrelevent. If you wish to discuss the merits of all the various projections then please start a new thread. The question I originally posted which you have not answered is if the world has been successfully and acuratly mapped how could an alternative ever be produced? The evidence for my claim is partly based on the known road and rail networks of the world that have known and fixed start and end points and known routes. This along with the millions of journeys that are undertaken every day that are based on our current maps I think validates my point. If you feel there are errors in our current maps could you please identify these errors along with evidence and an explanation of how you came to know about them. I am sure the people who live in the area in question, if such an area exists, would love to know where they have been going wrong. An additional question to you is, if you have ever undertaken a long journey to a location you have never visited before, whattypes of map do you use? I have started a new thread just in case you wish to discuss map projections as you appear to have some interest in them. That is used on board ships and planes navigating the surface of the earth? I always use a flat map, as does every person on the face of the flat earth. While aware of stated errors in charts and maps, I cannot state precisely what those errors are as those errors were not identified by those using the charts and maps in question: Only the issue of errors causing delays, such as those experienced on a recent Antarctic cruise on the latest, most advanced ship making the journey. The captain stated a couple of planned activities on that trip needed to be cancelled due to those errors. As I said paper maps are flat for the same reasons as tv screens and movie theatre screens are flat, convenience and technological limitations. Their physical shape bears no relation to the objects they either illustrate or portray. Mountains, lakes, forests, towns, cities are all three dimensional, but can happily be illustrated on a 2D paper map! Would you not agree? If we put that one ship and its journey to one side as it is only one such journey out of thousands that occur in the south Atlantic each year as you give no references to the exact ship involved or its circumstances. Would you agree that all the road maps depicting the roads on the continental USA are accurate? Would you say the same for Europe, Africa, Australia and the rest given that people drive on them every day of the year? Would you imagine if there were errors these would be reported? Or do you think that these maps contain errors anyhow? Going back to my original point, if all our commercial maps are accurate, just like the one you said you used, how can their ever be a place for a flat earth map that would necessitate an alteration to world geography and at astroke render many commercial maps redundant . ......and as I said no flat earth map,....no flat earth. How many times do I need to write all maps are relatively accurate. Initial maps were formed while exploring specific areas, not taking into account any supposed sphericity: Indeed, the explorers were uttering the immortal phrase, "It looks flat to me," as they traversed the countryside they were mapping. One could plot the same distances of the mythical spherical earth upon two pyramids with their bases conjoined. Distortion of shapes and distance, as with any other imperfections, will exist in any imperfect world. Your statement regarding thousands of journeys made each year by ship in the Southern Ocean is highly dubious and I am relatively confident that each of these journeys (should they exist) would find a record of miscalculation logged regarding time and distance (likely due to an assumption of earth sphericity). What's more dubious than making this grand unfounded statement. What evidence are you basing "I am relatively confident that each of these journeys (should they exist) would find a record of miscalculation logged regarding time and distance" on? Going back to the original statement. If all the maps are correct it leaves no space for a flat earth alternative. I’ve asked the question a number of times, which of our current commercial maps are wrong. If none of them are wrong then, no flat earth map, and no flat earth. It’s an issue that is totally fundemental for flat earth believers, yet none can answer the question. If Earth is flat, why aren't there mapmakers and astronomers and pilots and navigators stumbling all the time over the simple fact that the Spherical Earth-numbers don't add up? Maybe, because the numbers of Spherical Earth do add up? ....and that’s the basic rub that no flat earth thinker has an answer to, even John. A simple thing like the accuracy of all commercial maps renders their whole idea of a flat earth version null and void and with it a flat earth.